Well, the time has come to face the reality that this wonderful experience at the Burke Library Archives is coming to an end. It has been a delightful semester of learning the basics of processing collections and just understanding the Burke Archives as a whole—the various record groups and how they interrelate with one another. Additionally, interacting with staff, other interns, and learning about the history of the Burke Library and Union Theological Seminary (UTS) has been such a positive experience. As I look back at my final weeks here, I am impressed that I have completed the following four collections: the Walter Rauschenbusch Papers, Paul Edwin Spiecker Papers, Henry Smith Leiper Papers, and Josiah Strong Papers. This final collection proved somewhat challenging, as the Strong Papers have been organized and reorganized by many people throughout the years. In addition to the Finding Aid for the Strong Papers, I worked on a detailed inventory that is available for users to better understand what the collection contains. Rev. Strong was an influential figure in the Theological world during the late 19th and early 20th centuries. He was a leader in the Social Gospel Movement, and served as Secretary of the Evangelical Alliance for a brief time. He created the League for Social Service, and published many influential books, among these Our Country and The New Era. A NY Times article about the League was published in 1899 and can be viewed here: http://query.nytimes.com/mem/archive-free/pdf?res=9800EEDF153CE433A25757C1A9679C94689ED7CF. Strong’s two daughters, Elsie and Margery, wanted to publish a biography about their Father after his death, and the papers that I processed contain manuscripts of the biography that various people were involved with over many decades. The collection also contains two boxes of correspondence that I delved into. It was incredible to read the letters that were written from the 1930s until the late 1960s between Elsie, Margery, and others who knew Strong or were assisting with the biography. In reading some of these letters, a narrative unfolds which paints a picture of two daughters who really loved their father. They wanted him portrayed as the great man he was. I have no doubt that this collection will prove valuable to researchers studying Rev. Strong. In looking back at my time working at the Burke, I am proud of my accomplishments. In addition to the processed collections, I have had the opportunity to contribute FA’s to Academic Commons (AC), the Columbia University digital repository. AC is a tool that enables the archivists to track which and how often collections are accessed online, so learning about how metrics plays a part in seeking funding has been informative. I have also learned about Archives Space, which is an open-source information management application for describing, managing, and providing access to archives, manuscripts, and digital objects. I appreciated Brigette taking the time to show the interns her professional portfolio and demonstrate how one can go about creating a website. I feel confident that I have gained practical skills for my future, and have learned about some of the challenges in maintaining a library and archive. I really enjoyed participating in the intern activities that were organized by Columbia University, such as getting a tour of many of CU’s libraries. It was interesting to see how other libraries are structured and operate. Speaking of interns, it was a pleasure working alongside Kate and Dave these past few months, and I will always look back fondly at our times sharing stories about the collections we were working on. I want to thank Brigette for being a wonderful mentor and always being so positive and enthusiastic about the work. Thank you to Beth Bidlack, Director, for her support and graciousness. Thank you to Matt, Betty, Ruth, Liz and the rest of the staff and student workers for their guidance and care. I will really miss the Burke! This entry was posted in Collections on May 22, 2015 by Margaret Kaczorowski. Greetings! It is hard to believe how quickly the last few weeks of my internship at the Burke Library Archive have flown by. I suppose it is because the experience has been educational, interesting, and fun. So far, I have met several warm staff members, and have appreciated the nuggets of wisdom thrown my way. Under the guidance of Brigette Kamsler, I have learned how to process two collections, and am finishing up my third. I have also had the opportunity to attend the Mid-Atlantic Regional Archives Conference (MARAC) in Boston where I met wonderful peers and gained valuable tools and advice for working in the Archival profession. In my first few days at the Burke Library, I was somewhat anxious and excited at finally putting theory learned in class into real-life practice on actual materials! In the past 8 weeks, however, those anxieties quickly dissipated, as I have processed three collections of the UTS Record Group Series 1. 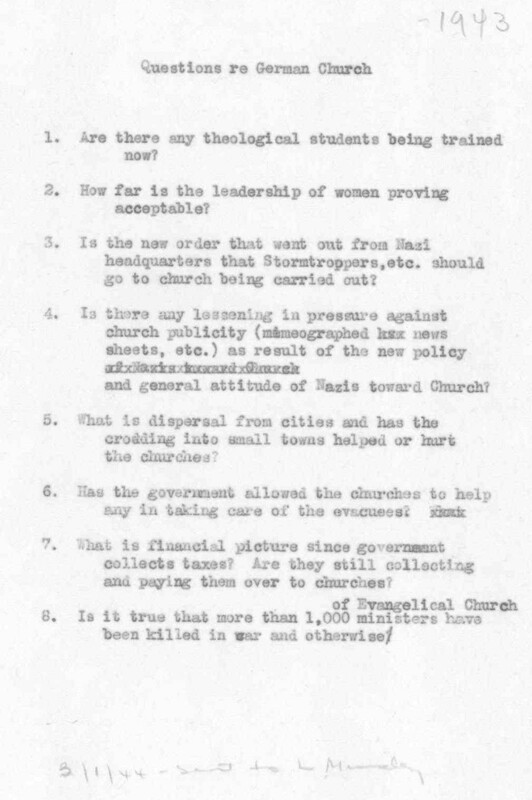 This series contains the records of faculty and students of Union Theological Seminary. It has been thrilling to handle these incredible documents that once belonged to faculty and students who had a profound impact in the theological world. The three collections I have processed so far from the UTS records group were made possible by a grant from the Henry Luce Foundation. The collection I am currently working on is the Henry Smith Leiper Papers. Dr. Leiper attended UTS from 1914-1917. Leiper was also very active in the Student Volunteer Movement. Leiper planned for a career as a missionary which led him to China and other parts of Asia. Upon returning to the United States, he served as secretary for numerous organizations, among these the Federal Council of Churches (FCC) and helped create the World Council of Churches (WCC). Leiper was considered to be an international religious leader, and therefore spoke at many religious functions, one of which was the Convention of United Church Women in 1956 as announced in the Ocean Grove Times. Leiper was a prolific writer and published many articles in various newspapers. 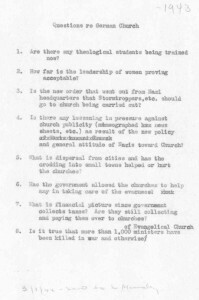 Many of these articles are contained in this collection in the form of clippings on subjects relating to what was happening in Germany and Europe during the 1930s: Nazi Propaganda, speeches. 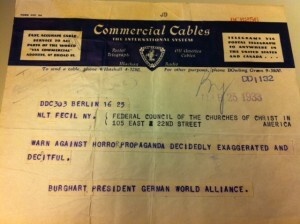 These papers are an incredible collection of materials about the fate of the Church in Germany during the Second World War, and the efforts of the FCC to bring the issues to the public and help in relief for victims of the atrocities being committed in Europe. This collection was originally processed almost 20 years ago, and I was able to go through the collection again and re-house the materials into acidic-free folders and boxes. I also enlarged the collection from 9 boxes to 13 boxes, as much of the material was overfilled in the original boxes. In addition, there were several fragile items that needed to be marked fragile on the Finding Aid (FA), the document that enables researchers to determine what the collection contains and whether it is valuable to their research. I maintained the order in which I found it, and just gave the folders more specific titles in some cases to make finding materials easier for users. 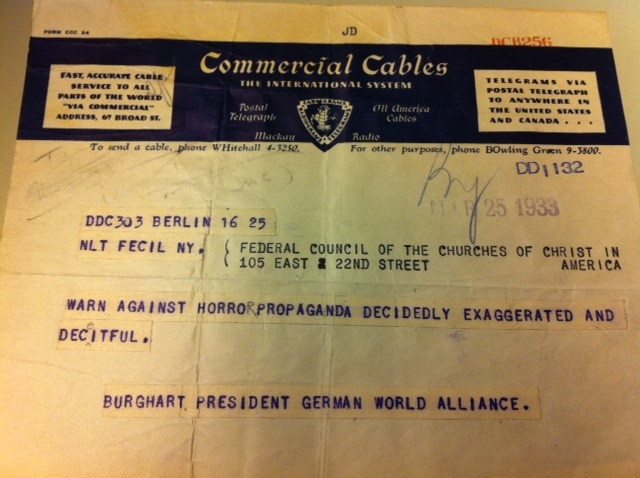 As I take in this incredible collection of documents, it really amazes me the breadth of his– and others– accomplishments to help those persecuted in Germany and elsewhere. Holding these documents in my hands reminds me again why I decided to get into archives in the first place. I look forward to the last few weeks of my internship at the Burke Library. Thank you for reading! This entry was posted in Collections, Student Entry on April 24, 2015 by Margaret Kaczorowski. I am excited to start my internship at The Burke Library at Union Theological Seminary and begin what looks to be an exciting, interesting, and educational journey into the world of archives and librarianship. After a whirlwind few weeks of applying and interviewing for several internships, I finally decided the Burke Library as the best fit, given its world-renowned reputation and its affiliation with Columbia University. Furthermore, I accepted the position because it provides a hands-on approach from a professional archivist. This approach will enable me to apply what I’ve learned in the past several semesters at the Queens College Graduate School of Library and Information Studies. It is both exciting and somewhat intimidating to finally begin my internship after learning about librarianship and archives! From the moment I stepped into this beautiful Gothic building and interviewed with Brigette, the Project Archivist, I realized that this library is the place for me to delve into the archival discipline that I have wanted to be involved with since I can remember. The Burke Library Archives was recently awarded a three-year grant from the Henry Luce Foundation to arrange, describe, and provide access to the Union Theological Seminary (UTS) Archive. The UTS Archive contains approximately 141 collections of papers from faculty members and students, among others, associated with UTS, one of the oldest and most important theological schools in the country. I am looking forward to working under the supervision of Brigette to process collections of UTS Faculty members, as she is eager to teach me; I truly appreciate her guidance and patient approach. My first day at the archive included a walking tour of the library, in which Brigette showed me the various stacks and office space that house the records. I especially enjoyed going up the spiral staircase in the original reference room of the Missionary Research Library, and admired the wonderful architecture of the grand reading area. I was introduced to some of the staff at the Library and look forward to assisting them in any way, and learning from them over the course of the semester. Although it was a lot of information to take in at once, I am sure that with time everything will fall into place. Prior to my first day I was given some readings, and among these was a very interesting article, The World Missionaries Made, which introduced me to the role and legacy that missionaries have played and left over the past two centuries. According to the article, missionaries fostered literacy in economically depressed countries in Asia and Africa, as well as assisted the colonized people in many other ways that I was not aware of. In working on the papers over the next few months, I look forward to learning about the role that faculty members have played at UTS, and in the world of theology as a whole. I am certain that in bringing my enthusiasm and skills to the internship, I will in turn gain a tremendous amount from the internship and the Burke Library staff. This entry was posted in Collections, Student Entry on February 13, 2015 by Margaret Kaczorowski.